BBC defence correspondent Caroline Wyatt said the incident was "incredibly embarrassing" for the Ministry of Defence (MoD). HMS Vanguard returned to its home base Faslane on the Firth of Clyde under her own power on 14 February. "Very visible dents and scrapes" could be seen as tugs towed her in to the port on the final stage of the journey, our correspondent said. The submarines are equipped with sonar to detect other vessels nearby but our correspondent said it might be the case that the anti-sonar devices, meant to hide the submarines from enemies, were "too effective". "This is clearly a one-in-a-million chance when you think about how big the Atlantic is," she said. The two submarines are key parts of each nation's nuclear deterrent, and would have been carrying missiles, though both the UK and France have insisted there was no danger of a nuclear incident. They were carrying around 240 sailors between them. A French naval spokesman said the collision did not result in any injuries to the crew. Le Triomphant is based at L'Ile Longue near Brest, north-west France. HMS Vanguard arrived back in Faslane on Saturday. 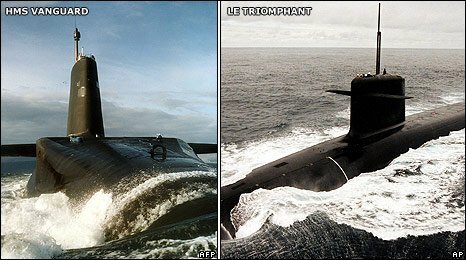 On 6 February, France's defence ministry had said that Le Triomphant "collided with an immersed object (probably a container)" when coming back from patrolling, and that the vessel's sonar dome was damaged. But in a subsequent statement, it admitted that the collision between the two submarines took place. "They briefly came into contact at a very low speed while submerged," the statement added. Retired Commodore Stephen Saunders, editor of Jane's Fighting Ships, said the cause of the collision appeared to be procedural rather than technical. "These submarines should not have been in the same place at the same time," he added. Nuclear engineer John Large told the BBC that navies often used the same "nesting grounds". "Both navies want quiet areas, deep areas, roughly the same distance from their home ports. So you find these station grounds have got quite a few submarines, not only French and Royal Navy but also from Russia and the United States." In 1992, the US nuclear submarine USS Baton Rouge was struck by a surfacing Russian nuclear sub in the Barents Sea. 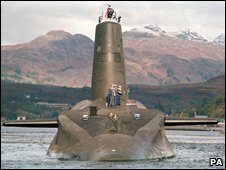 When the nuclear submarine HMS Trafalgar ran aground during a training exercise off the coast of Skye in 2002, the damage was estimated at £5m ($7m). HMS Vanguard completed a two-year refit completed in 2007 as part of a £5bn contract, and is not due to be replaced until 2024. Politicians have demanded more information on the latest incident. Lib Dem defence spokesman Nick Harvey has called for an immediate internal inquiry with some of the conclusions made public. 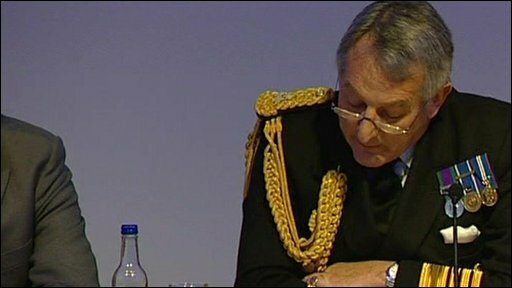 "While the British nuclear fleet has a good safety record, if there were ever to be a bang it would be a mighty big one," he said. "Now that this incident is public knowledge, the people of Britain, France and the rest of the world need to be reassured this can never happen again and that lessons are being learned." Meanwhile, SNP Westminster leader Angus Robertson has called for a government statement. "The Ministry of Defence needs to explain how it is possible for a submarine carrying weapons of mass destruction to collide with another submarine carrying weapons of mass destruction in the middle of the world's second-largest ocean," he said. The Campaign for Nuclear Disarmament described the collision as "a nuclear nightmare of the highest order". CND chair Kate Hudson said: "The collision of two submarines, both with nuclear reactors and nuclear weapons onboard, could have released vast amounts of radiation and scattered scores of nuclear warheads across the seabed."